Wander route: Città Sant’ Angelo (317 mt – 0 Km), Restaurant La Mugnaia (10 mt – 10 Km), Collecorvino (263 mt – 20 Km), Loreto Aprutino (265 mt – 34 Km) and Nocciano (363 mt – 51 Km). Startpoint is Nocciano Sant’Angelo, a neighbourhood that lies between the rivers Salinello and Piomba, known from the XII century as “Castrum Sancti Angeli”. Visit the St. Maichael’s Collegiata of the XIII century. Older than Nocciano is Collecorvino, built in the IX century on the top of the hill between the river Fino and Tavo valleys. Here you can see the Duke Castle and the Sanctuary of Incoronata. Another must is the ancient Lauretum, today known as Loreto Aprutino, that hosts the Matrice, a XV century church, the Baron Acerbo’s Castle, a Museum of ancient Abruzzo ceramic and the St. Mary in Piano’s Church, with the frescos of the XIV century. The road ends near to Nocciano. Into the centre of the town today you can still see the ancient Castle, the church of St. Lorenzo in romanic style and Aliprandi Castle. Springs onto the route: Near to the huts on the dirts. At a spring near the neighbourhood of Bussi. The route goes between hills, mountain slopes and mountains. On Mount Picca’s slopes, into the valley of a little river that ends into the river Pescara, lies Pescosansonesco. The neighbourhood is devided into 2 zones: the new town and the old centre, abandoned after a landslide in 1934. A typical mountain town is Bussi, on the Tirino river’s side. Bussi has a medieval historical centre, where is the ancient of the IX century and the Cathedral. In the protected area it’s easy to meet wild boards, bucks, wolves and fawns. Wander route: La Frontera (640 mt – 0 Km), Tossicia (409 mt – 6 Km), Forca di Valle (808 mt – 10 Km), Gola del Gran Sasso (412 mt – 15 Km), Castelli (469 mt – 23 Km), San Rocco (681 mt – 25 Km), Rigopiano (1038 mt – 34 Km), hut Acerbo (1165 mt – 35 Km), Vado di Siella (1725 mt – 37 Km), Fonte Vatica (1632 mt – 40 Km). 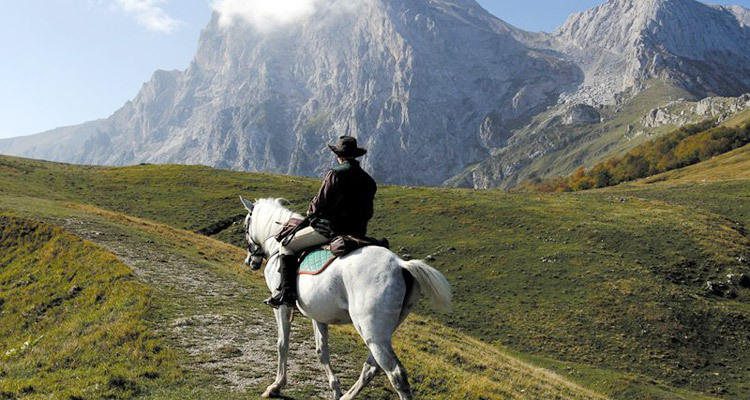 Type of route: lovely trekking route for learnt riders, for the ma consigliato solo a cavalcatori esperti, for the difficult mountain climb of Vado di Siella. The route goes into national reserve of Gran Sasso and Laga’ Mountains, from the flowered fields till the Teramo slopes, to the amazing Campo Imperatore through noumerous ancient suburbs, which hosts wanderful things. The startpoint of our route is Montorio al Vomano, ideal path that joins Vomano Valley to Gran Sasso Massiv. Located near the River Vomano, into the historical center of a town named Mons Aureus, lies the Collegiata of Saint Rocco,. the Church of the Zocolanti, and the Church of the Cappuccini with its Abbey. From Montorio you come to Tossicia, the ancient capital of the Sicily Valley, that hosts the Tosia Villa, Ornano’s Baron, built in IX century. You have to see the Cappella of St. Antonio, the Church of Saint Sinforosa, the town church of Assunta and the ancient castle, which hosts the Comune today. The Island of Gran Sasso too helds important memorys Middleve and Renaissance: the Church of St. John ad Insulam of the XII century, St. Sebastian’s Chappel and the Church of St. Massimo. Well known is the sanctuary of St. Gabriel of Assunta, pilgrimage place. The route grazes also Castelli, a town known all world round for handmade ceramics, that lies to feet of the northern wall of Mt. Camicia between the rivers Rio and Leomogna. Campo Imperatore always lends its fieds to horse-riders and invite them to a sublime and adventurouse day on saddle. Wander route: Fonte Vetica (1632 mt – Km 0), Colle Caciaro (1562 mt – Km 5), Castel del Monte (1489 mt – Km 10), Piano S. Marco (1065 mt – Km 15), Ofena (566 mt – Km 19), Madonna del Piano (363 mt – Km 23), Collelungo (422 mt – Km 24), Capestrano (505 mt – Km 27), Sella di Navelli (967 mt – Km 32), Tredici Rane (929 mt – Km 33), Collepietro (873 mt – Km 34). Type of route: middle-hard route, which gives the opportunity to pass through Cmpo Imperatore. The firts part of the route needs full attention, for its rocky ground. Time of year: From the end of spring to the beginning of fall, except winter for snow. Springs onto the route: source to water the flocks in Campo Imperatore and springs into the suburbs. This route passes through the amazing highland of Campo Imperatore, where a long time ago the flocks went on dirts to the Plateu of Puglia. Little towns as Castel del Monte, Rocca Calascio and St. Stephen of Sessanio were the defensive walla of the highland. You have to see the Ricetto of Castel del Monte and visit the Madonna del Suffragio Church and the town church of Saint Mark Evangelist. In St. Stephen of Sessanio there is the Medici-Tower, which seems Rocca Calascio whith its medieval Castle. When you go to Ofena your ride graze Capestrano, a name that we can find in books from the IX century. In the hystorical centre, in front of Piccolomini Castle, you can admire a wonderful fountain. Capestrano is famous for its architecture and for its IV century b.Chr. warrior’s gravestone, today hold in the Museum of Chieti. Before reaching the characteristic Rocca di Collepietro you can cave a sight of Navelli, a suburb known for the production of saffron. Wander route: Tornimparte (850 mt – 0 Km), neighbourhood “Carasolo” (1550 mt – 15 Km), Campo Felice (1600 mt – 22 Km), Forcamiccia (1900 mt – 27 Km), Rocca di Mezzo (1277 mt – 35 Km). Type of route: wanderful and averageable route, suiteble also to beginners. Springs onto the route: fountain along the street every 3 Km ca. Even if our ride begins in Colle San Vito di Torninparte we have to spend a few words for L’Aquila, the near cheftown of Abruzzo. L’Aquila offres many monuments: the Cathedral of St. Bernardino, the Fountain of the 99 Cinnamoons, the XVI century’s Fortitude, which hots the Nationale Museum of Abruzzo in its rooms, and the Basilica of St. Mary of Collemaggio, whose miliary stone was set from Pietro da Morrone’s hand in 1287, who became pope Celestine V seven years later and abdicated his charge. The ride grazes Rocca di Cambio, which hosts the churches of Annunziata and St. Lucia, both built in XIII century, and ends in Rocca di Mezzo, a touristic centre, on the highlad of the Rocche, from were you can start a route through Regional Park Sirente-Velino. Time needed: 7 hours ca. The ride brings you through the Majella Massive, a mountain sourrounded by myths and legends; one of them tells that its name comes from the cult of the godness Maja. The Majella is a holy mountain, full of abbeys and heremitages that you can still see, which were built by Pietro da Morrone, Pope Coelestin V and by his disciples. The route passes throgh Lama dei Peligni, a suburb built in VII century on the eastern Majella slopes near the river Aventino. The hystorical testimonianza is given by the the town church of St. Nicola, the Duke Castle and the stone fountain at the gate of town, told Fontecannella. Outside the townwalls you can see the hermitage of St. Angelo Cave of the VIII century, whch was probably a cult place in pagan times. In Fonterossi the carcass of a woman from 6000 B.Chr. was found. In Lama dei Peligni you have to visit the Cavallone Cave and the Archeoligical Museum of Natural Sciences and the Botanic Garden, where you can make an ideal trip to explore the Majella’s flora, thanks to a fine reproduction from Lama dei Peligni up to Monte Amaro. Wander route: Rivisondoli (1226 mt – 0 Km), Madonna della Portella Pass (1282 mt – 5 Km), Cinquemiglia Highland (1244 mt – 6 Km), Rocca Pia (785 mt – 20 Km), Pettorano sul Gizio (583 mt – 35 Km), Sulmona (420 mt – 47 Km). This route passes through the wide areas of Rivisondoli and Pescosansonesco, two ancient suburbs, which held their architecture thrugh time. Rivisondoli is well known for its living manger on snow. Pescocostanzo is a little town of the Renaissance, famous for its jewellery, its laces worked by tombolo, its handicrafts of caved wood. The ride passes through the century trees of St. Antonio forest and ends in Sulmona, with its buildings and works of art: St. Panfilo Cathedral from the XI century and the roman Waterway. Near there is the hermitage of St. Onofrio, built by the man known in history as Pope Coelestin V.